Everyone has their safe area when it comes to taste and personal styling. I've never really ventured down the monochrome route and always reach for navy instead of black. Recently, I've started to pick out pieces that not only look great on, but that are super easy to team up. I'm going through a transitional period in finding my own style and creating a newly vamped wardrobe. This outfit was inspired by a recent trip to Whistles. They are great at creating versatile pieces and the grey jersey jumper is perfect for layering and creating a range of outfits. I like when a piece has something different about it and this sweatshirt is a great alternative to the classic knitted jumper. I think it goes perfectly with a tailored oxford shirt and structured trousers. It offers that juxtaposition in material and mixes it up. 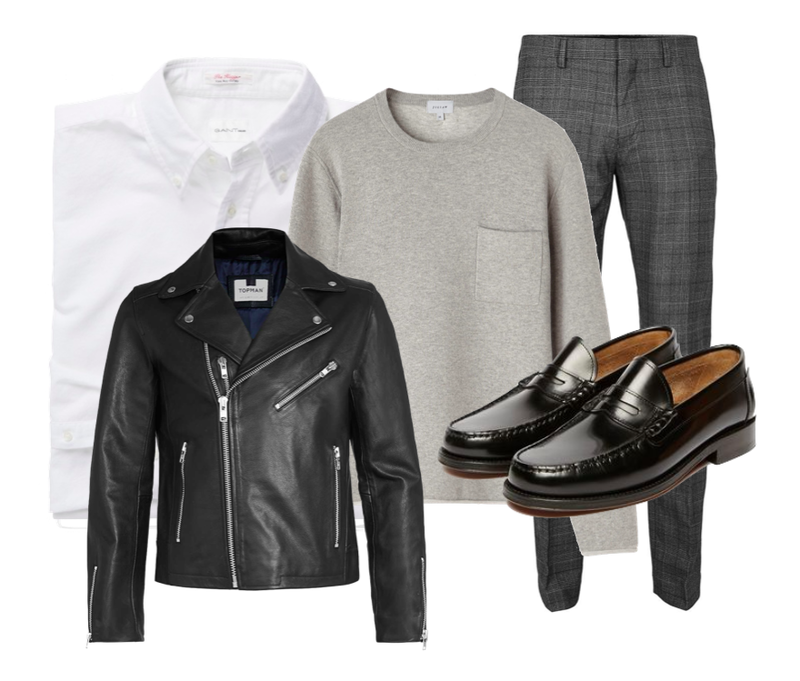 Paired with a leather jacket and loafers, the completed look gives different styling opportunities, depending on the occasion. Its just as well suited for a day exploring the city as it is to a a drinks reception in the evening. The mix of jersey, leather and classic cotton textures, creates more depth and interest and gives the wearer more flexibility on how they want to portray their personal style. TIP: Try different shades of the same colour, starting with the lightest on the bottom layer and darkest on top. Add a pop of colour with the shoes. I chose a classic oxblood loafer as this added something different and drew the eye in. With block colours on top, I went for a slight pattern in the trouser. It again, adds to the texture and makes more of a statement than a regular pair of denim. If this isn't your style, try a ripped black skinny jean. It'll give a more casual look whilst giving you a effortless style.